Non-medicinal ingredients: tapioca starch, tricalcium phosphate. Capsule: hypromellose. *Produced under patent US2006/010032 licensed from Caudill Seed Inc.
AOR™ guarantees that all ingredients have been declared on the label. Contains no wheat, gluten, corn, nuts, peanuts, sesame seeds, sulphites, mustard, soy, dairy, eggs or shellfish. Pro Phase II Detox consists of calcium D-glucarate, at 1500 mg- the highest on the market, to promote the detoxification of cells at a cellular level, the probiotic Bifidobacterium longum, and broccoli extract. Through supporting phase II detoxification as well as maintenance of proper gut flora, this formula ensures that products of detoxification are safely and promptly eliminated. This formula also promotes healthy estrogen metabolism for both men and women, which is useful for estrogen dominant conditions. Cellular protection through healthy detoxification is associated with reduced risk for the development of a number of cancers, and for optimal cardiovascular, endocrine, and gastrointestinal function, to reduce the physiologic repercussions related to cellular damage and can be incorporated into weight loss plans,. 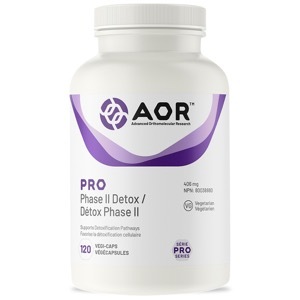 AOR's Pro Phase II Detox was introduced into the professional series based on its wide clinical applicability, as detoxification is central to many treatment protocols. Cautions: Caution in use beyond 28 days or prior to use in patients taking any medications, have nausea, fever, vomiting, bloody diarrhea, severe abdominal pain or an immune-compromised condition (e.g. AIDS, lymphoma, patients undergoing long-term corticosteroid treatment). Discontinue use and reassess if symptoms of digestive upset (e.g. diarrhea) occur, worsen, or persist beyond 3 days.